Even experienced managers with a project management certification can use some project management tips to handle difficult projects from the beginning till the end. Being in charge of a project makes you responsible to complete work within a stipulated time and budget. More importantly, managing a project means continuously monitoring employee performance, encouraging them to give their best. Certainly, some good tips can be useful in efficiently fulfilling these responsibilities. Moreover, following proven tactics enables you to stay focused and overcome any challenges. In order to help project managers achieve greater success, this post offers highly effective project management tips. Collecting complete details of a project is the first step. Having stakeholder approved details of a project determines its scope. Furthermore, if your company is a victim of the most common time management statistics, you need project details to set a time frame with achievable milestones. In addition to that, you can determine exact budget for each stage of the project, keeping the costs in control. Beginning a project with all the details allows you to accommodate the requirements of clients more effectively, preventing deviation from the pre-determined scope. The next important tactic is building a project management team, consisting of efficient employees with good employee performance. Choosing the right team members is essential to complete a project satisfactorily. While building a team, select employees with complementing skill sets or project management certification. At the same time, make sure not to include too many people in the project. Keeping the number of team members limited to six or ten people will keep everyone focused. Moreover, a small team is much easier to manage with less direct reports to deal with. Finally, select employees who have the skills to handle the project tasks. Surely, a strong team will ensure smooth completion of the project. After building a PM team, you need to become a leader. This meaning cultivating a positive team environment in order to achieve the best project results possible. 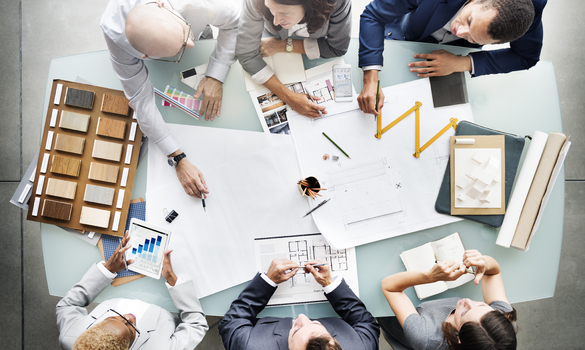 In order to cultivate good team dynamics in project management, as in the property management business, you need to brush up on your leadership skills. When you cultivate a good team dynamic, you enable yourself and your employees to demonstrate the most effective collaboration. This is certain to help you deliver top level end results for any and all projects. Right before you start working on the project, setting realistic goals is a great technique. Setting goals include breaking down the project in a series of tasks and allocating a specific time period to complete each. This methodical approach of setting realistic goals will assist you and your team members in meeting deadlines easily, an effective time management principle. Furthermore, your employees will get a clear idea about the things that need to be done in each phase of the project. Then, they can enhance their self improvement strategies while also providing the necessary work. Most importantly, realistic goals bring order to project management, increasing productivity. If you want to ensure the success of your project, you must first define success. How will you know that you have completed the project to the best of your ability? In order to be able to produce the best end result, you need to define that ideal end result. This is true no matter whether you are working for a mobile magazine or a business technologies company. It will also help to define measurable goals along the way that will enable your team to reach the ultimate goal. Set measurable goals for the duration of the project, and be sure to define what project success will look like and how you will know you have reached it. Proper communication simplifies projects. One of the vital project management practices is developing a communication plan that utilizes advanced communication technologies like conference calls, document management and cloud sharing. When all of the team members are communicating effectively with each other, they are capable of cooperating. Plus, continuous flow of communication keeps team members on the same page, making it possible to finish tasks quicker. Another aspect of clear and effective communication is providing necessary information to team members. Also, holding weekly meetings will helps solve problems and create solutions. Of course, paying attention to communication can prevent problems before they arise. This particular tip may not seem like it aligns with the topic at hand, but you would be wise to realize how important emotional intelligence is in every interaction you have in both your personal and professional life. The ability to “read people” or look beyond the words someone is saying to see what they actually feel is one of the most crucial leadership characteristics. Emotional intelligence will help you when delegating tasks, rewarding good work, managing a team and dealing with issues that may arise. Improve your emotional intelligence for success in the field of project management and in your career and personal lives, as well. Managing project risks is an unavoidable task. Developing a risk management plan during project planning will anticipate many risks. If you are prepared in advance, tackling project risks will not require a certified risk analyst. In fact, establishing risk management best practices facilitates project progression and completion. In order to dominate managing people, you need to teach them the top strategies for solving problems. One of the most effective project management tips to consider implementing is to factor risks into your timelines. As a manager, you hit obstacles on a daily basis. Unfortunately, you cannot overcome them on your own. The team that you manage has to work to solve their own problems. Moreover, they need to do so in a way that allows them to meet their deadlines. This is true for both virtual employee management and in-person management. With this in mind, you need to include potential problems and the time they will take to solve into your timelines. Then, your teams will remain productive and meet deadlines. Project management tips offer important tactics required to complete a project. Gathering project details, building a team and setting achievable goals are project management tips that most project managers follow. In addition, you should establish an implementation plan, as well as communication and risk management best practices while overseeing a project. On the whole, following the various project management tips simplifies your job as a project manager, improving the final outcome.